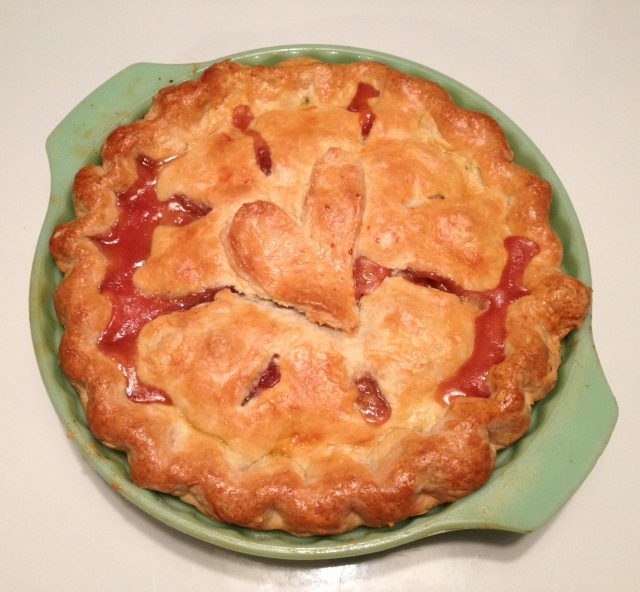 Then, instead of writing, I made pie. Chopping jewel-hued stalks of rhubarb and rolling out butter-dotted dough took my mind off the heavy things. It didn't cure our society's evils. But it helped to cure my mounting blues. A little. Once again. And then...I got to hear author David Sedaris speak last night at a local university. As always, he was hilarious--witty and raw. I laugh so hard; it was such a release. On the way home from the reading, I thought about laughter...about how good it felt to chuckle and guffaw. I need to do that more often. Laughter is just as healing--even more so--than my favorite comfort foods. When I got home, I settled down with one of David's books (I own nearly all of them)...and a piece of pie. And in that moment, life was pretty good. To make the filling: Mix all the ingredients & set aside. To make the crust: Mix the flour, sugar, & salt in a large bowl. Cut in the butter with a pastry blender or rub it through your fingertips until you have pea-sized pieces. Add the water, 2 tablespoons at a time, "fluffing" the dough with your fingers after each addition, just until the dough comes together. Gather into a ball & cut in half. Roll out half of the dough & place into the bottom of a pie plate. Add the filling. Roll out the other half of the dough & place on top of the pie, folding & crimping the edges. Brush the pie evenly with the egg/water mixture. Bake at 425 degrees for 15 minutes, then lower the heat to 375 degrees and bake for 20-30 minutes or until the crust is deep, golden brown. Remove from the oven & let cool before slicing. Your pie looks gorgeous! Honestly, a little David Sedaris and rhubarb pie sounds like the best way to feel a little better after the horrible events of weeks ago.